Wood and Bone Pendant Necklace from Indonesia, "Frog Fortunes"
Symbolizing fecundity, prosperity and wealth, the frog is believed to bring good luck. Inspired by tribal tattoos, Balinese artisans design this original necklace from the Pertiwi Collection. 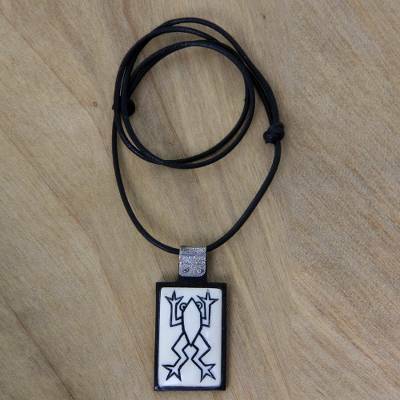 They carve the image on cow bone, which is then set on an ebony wood pendant. Featuring an antiqued sterling silver bale, the pendant hangs from a waxed linen cord. You can find ebony wood and bone pendant necklace 'Frog Fortunes' by Pertiwi Collection in jewelry categories such as Animal Themed Necklaces, No Stone Necklaces, Ebony Wood Necklaces, Bone Necklaces, Wood Necklaces, Linen Necklaces, Pendant Necklaces and Cord Necklaces. Enjoy exploring these sections for other Novica treasures.